I’d been so busy these last few weeks—finishing the anthology, cleaning the house, working on the magazine, and a million other things—there was no time to think about this residency: what it would be like, who would be there, what I would work on. And then suddenly it was time to pack the car and go. So off I went, with Bhikku occupied with a treat and in TJ’s capable care, I hit the road a little before 7am on Tuesday. The day was beautiful—not too hot, only a few clouds—and the time flew by, partly because I was listening to an audiobook, but also because I was simply enjoying the drive. At first, that drive was through familiar territory, down I-81 into Tennessee, a trip I’ve taken many times on my way to Sewanee. But for the first time I turned south toward Asheville and into the mountains. The scenery was amazing, and then I came to Asheville, where the directions did become a bit more complicated. 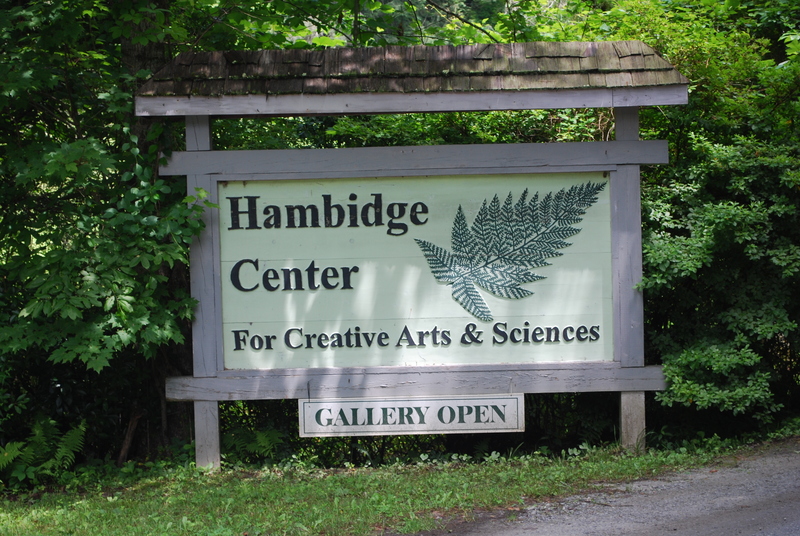 But I found my way, and soon I was entering Georgia and pulling into the grounds of Hambidge. The first thing you see is the Rock House, the public area for the residents. But the office is entered through the Gallery, so that’s where I headed. After my orientation chat with Deb—talking about the wildlife that might be encountered, where to shop, etc.—we went over to my cabin, Cove Studio (formerly known as Son Studio, not to be confused with Son House) and I got settled. I brought a lot of stuff, so that took quite a while, although I did take a break to run out to the grocery store and to stop at the great produce stand not far from the Center. While I was settling in, rain began, apparently a daily occurrence. In these deep woods, the rain continues to fall even after it has stopped, as it drips from the trees, from canopy to understory to rooftop. Lovely. After dinner I had to make a call, so I drove 2 miles to get cell reception—not that much of a hardship, as it turned out (although I later realized it was an 800 number and I probably could have made that call from the Rock House), and then I returned to Cove to get comfortable. Cove is pretty deep in the woods, surrounded by huge rhododendrons that are currently in bloom. Eventually I’ll take some pictures and post them. And then forest disappears when night falls . . .